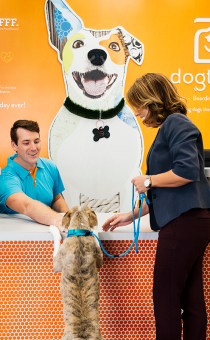 Do you have questions about Dogtopia’s premium daycare, boarding or spa services? Please contact us and we will respond to your inquiry shortly. What does the Meet & Greet entail? A meet and greet will be conducted by one of our trained professionals on-site with every new dog before bringing them into a playroom. Our trained team with talk to the pet parent about the dog’s history and health. 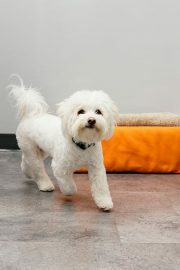 Once complete, the dog joins our team member in a separate room to observe how they react when away from their parent. During this time, we will conduct a snout to tail assessment to identify sensitivities in touch that the dog may have. If a dog is sensitive to touch in one area this is not necessarily an issue, but it is important for their comfort that our team is aware of any sensitivities. We then begin bringing additional dogs into the controlled mini play area one at a time to assess the comfort level of the dog. Our team observes how the dog interacts with the other canines to determine their suitability for an open play environment. If for some reason the dog is not yet ready for open play, the team member will recommend steps the parent can take to help address the observed issue(s). Any dog is always welcome to come back for a follow-up evaluation after any issues have been addressed. 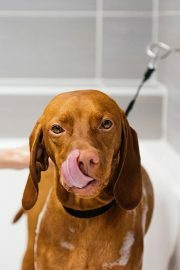 This process assesses your dog’s temperament and determines if Dogtopia’s facilities will be a right fit for your pet. Food is prepared exactly as requested by each pet parent. Each location also provides in house lunch food at no extra charge for days when the lunch is forgotten. I have an older dog; what steps will you take to ensure that they are comfortable? Our playroom’s flooring is made of compressed rubber, the same material they use in day cares for children. Not only does this protect the pads of dogs’ feet, it also provides a comfortable walking service for dogs suffering from hip dysplasia and other ailments. Unlike other dog care facilities, we separate our play areas with walls instead of chain link fences. Not only will this protect against airborne contagions, it will also prevent overstimulation that may come from dogs seeing others dogs that they cannot play with. What happens if there's an incident between my dog and another dog? At Dogtopia, we strive to create a safe environment for dogs but we understand that not every dog will get along. Our team is highly trained to understand dog body language, and if we see that an animal is becoming agitated and aggressive, we will take steps to remove that dog from the situation before it can escalate. Since our environment is like a child’s daycare, we do acknowledge that the occasional squabble may break out. That’s why we train our team to recognize these situations and remove a dog that may cause problems with other canines. We use home-style crates during naptime (12 to 2 p.m.) because it gives dogs a safe den to rest in, offers them some “me” time, and allows the staff to safely dispense individual food for dogs who eat lunch and/or medication if applicable. Similar to children in a daycare, dogs tend to easily adapt to the naptime routine as it’s at the same time each day and all their friends are enjoying the often much-needed down time as well! During naptime, the staff also thoroughly cleans each playroom to ensure the room is safe and clean before another rousing round of afternoon play! Crates are also utilized for overnight boarding, generally from 9:30 p.m. to 6 a.m.
Why is my dog sometimes seen in a crate during open play time? At Dogtopia, we work hard at creating a safe environment for dogs. Although every dog is evaluated prior to open play, disagreements or altercations may and will occur from time to time – similar to the playground at a child’s daycare. 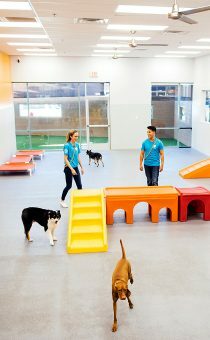 Our team is highly trained to understand dog body language and to proactively manage the playrooms. When one dog offers a correction to another that is not well received, we intercede before it escalates. This may result in removing a dog from open play or doing rotations among dogs in potential conflict. Additionally, staff is also trained to recognize that dogs sometimes need a little “me time” so we utilize the crates to allow this quiet time for the dog. Why do you require that dogs are spayed or neutered at 7 months? At Dogtopia, we are focused on the health and safety of all the dogs that come play with us. Our main reason for requiring dogs to be spayed or neutered is to reduce the potential levels of aggression that testosterone can create. It is not always the un-neutered male that can create the tension, but detectable hormones released by an intact dog can trigger other dogs to become more aggressive. Additionally, we must consider reproductive concerns for dogs in open play. What vaccinations are required for my dog to stay at Dogtopia? At Dogtopia, your dog’s safety and wellbeing is our first and foremost concern. That’s why we have a number of measures in place such as double doors, full walls, certified pet-friendly cleaning supplies, floors made from compressed rubber to reduce the impact on the pads of dog’s feet, joints and hips, soundproofing throughout to keep nervous dogs at ease and a climate-controlled environment. We’ve also put various protocols in place to reduce the risk of illness and accidents. To further this objective, we require that all furry friends are current on required vaccines. Vaccinations must be given by your veterinarian at least 48 hours before attending Dogtopia. It is our preference that vaccines are given seven days prior. Rabies: Required once at 16 weeks of age in puppies, then given again 1 year later (1 year, 4 mos. of age) and then every three years going forward. Dogs are required by law to be vaccinated against the rabies virus because this deadly virus can spread to humans. DHPP (DHLPP) (also called Distemper): Required as a puppy series beginning at 6-8 weeks old, boosted twice at 3-week intervals and again a year later. Like rabies, after the first year, the distemper/parvo combination vaccine can be given every three years. Bordetella: Required to be current by 12 months from date of vaccine. Most veterinarians recommend the Bordetella vaccine be given every 6 months to maintain a high level of immunity for dogs who are often in social settings. Do I need to bring my dog on a leash? Yes! We require that all dogs are on a leash or slip lead with a collar/harness both in our parking lot and in our lobby. Besides giving you a safe environment to leave your dog in, it will also help with their socialization and help them to stay fit and active. 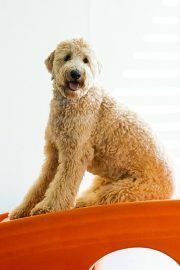 Check out our Dog Blog for all of the health and social benefits daycare can offer to your dog. What if I forget to bring my dog’s food or bedding? 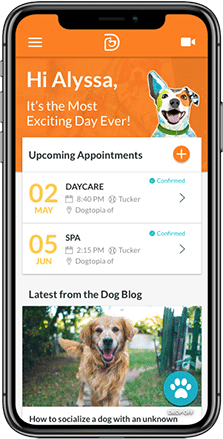 Not to worry; most Dogtopia facilities come with a fully equipped boutique that caters to all of your dog’s needs, from food to bedding and much more at an affordable price. We offer overnight, weekend, and extended stay boarding. If my dog is staying at Dogtopia overnight or for a weekend, can I get them groomed as well? Absolutely! We offer spa options as part of our boarding packages. What if I just want to get my dog groomed without leaving them overnight? We offer spa services by appointment as well. Some of our locations also offer grooming. My dog is nervous about loud noises. What options do you offer for drying them? We offer a number of options for drying your dog based on their noise tolerance. Choose from a crate hair dryer, a hand-held hair dryer or other options.